Customer onboarding process in telecom is a critical process in which the turnaround time is important to ensure customer satisfaction and loyalty. DocPro application is used by telecommunication companies to save the turnaround time between customer submitting the application form till the requested service is activated. The distributor collects the Customer Application Forms (CAFs) and the KYC documents do a first level check to ensure the KYC norms are met. A runner on bike collects the CAFs from the distributors office and then carries it to the nearest processing location for completing the processing of the CAF. The runner may have to do multiple runs in a day between the distributor and processing centre depending on the number of forms collected by the distributor. The runner may also carry rejected forms from the processing centre to the distributor for correction or collection of correct documents. There were eight processing centres across Mumbai to reduce the travel time for the runners. 1. Quick implementation: The client wanted that the solution should be implemented quickly with minimum disruption of the ongoing process. We were able to gain the client confidence by showing a proof of concept implementation of the process. This gave the client the confidence that DocPro can be implemented quickly. 2. Easy configuration of process: DocPro Workflow is very easy to configure any type of process. DocPro is conducive to even very complicated processes, which can be configured easily, tested and then deployed with minimum fuss. 3. Low training requirement: Client wanted that solution should be intuitive to the users and training should be at the minimum. DocPro provides an easy and intuitive interface to the users which reduces training and handholding to the minimum. 4. End-to-end visibility of the process: Client wanted to gain end-to-end visibility of the process and get alerts for any impending bottle-necks so that corrective action can be taken to arrest failure. DocPro provides real-time dashboards and email alerts for process parameters that are approaching the failure threshold. Client is now able to take corrective action before it is too late thus avoiding process failures. 5. Quick ROI: Client wanted a solution that will give them a quick return on the investment made in the solution. After implementation of DocPro client was able to run the entire operations with one processing centre with reduced number of employees as compared to eight processing centres earlier. The number of runners employed for moving the forms was reduced considerably. Client was able to reduce the costs substantially gaining savings that gave ROI within a period of one year. 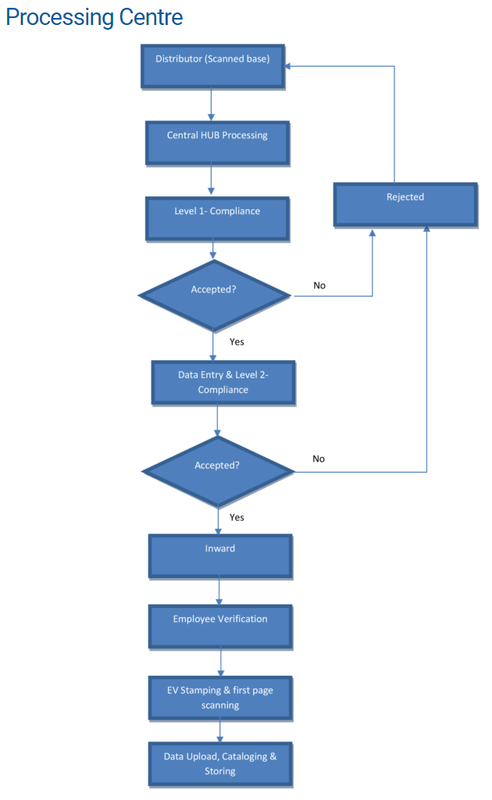 The entire process as required for the CAF processing is configured in DocPro Workflow as shown in the flow diagrams below. 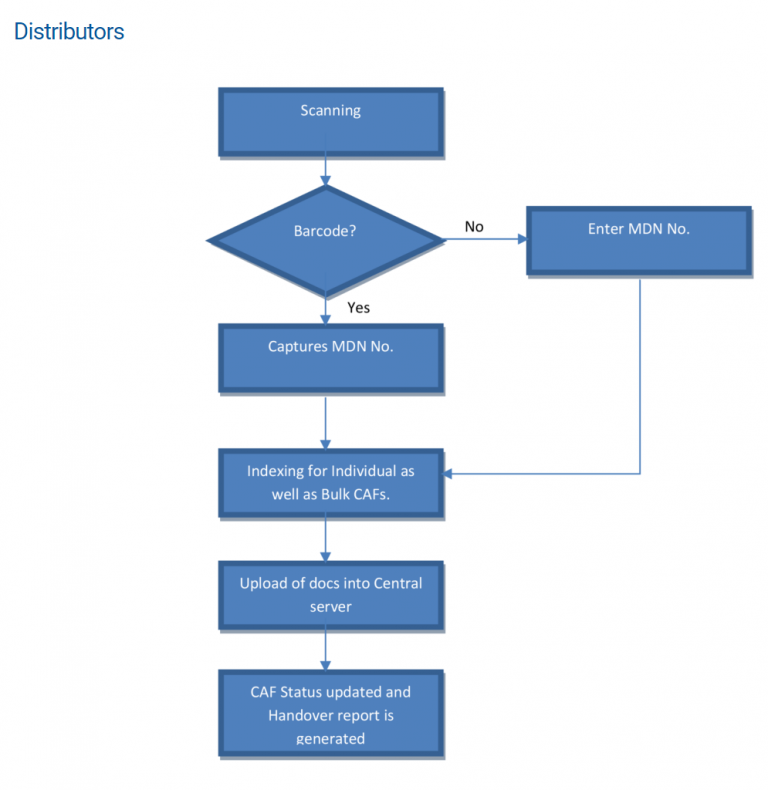 DocPro Workflow provided an easy interface to the distributors to scan and upload the CAFs along-with the KYC documents. The scanned images are instantaneously available to the processing location in DocPro. 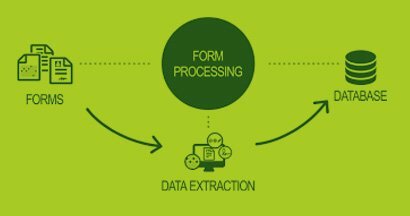 Scrutiny, Data Entry, Audit and the various activities as shown in the process are done by the various users in DocPro. All the activities are configured in DocPro, access rights are given to the users as required. Users perform their activities as configured in DocPro. The physical files are brought to the processing centre eventually and handed over to the Records Management vendor for archival. DocPro handles the entire process seamlessly and provides dashboards for easy monitoring of the entire process. DocPro ensures 100% compliance to the process because DocPro ensures that users perform their activities as defined in DocPro.